Mary presented and consecrated Jesus in the temple, we ask her now to consecrate and present us to the Sacred Heart of Jesus. 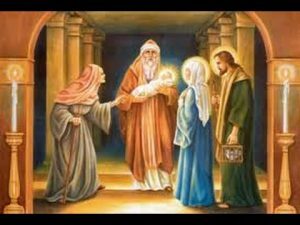 Mary took Jesus to the temple because He Himself would become the New Temple who makes sacred and holy the house of God through His Eucharistic Presence on earth. Simeon’s prophecy of Jesus being rejected continues in our age as the Holy Eucharist is an embarrassment to the proud today, just as His incarnation, and His Cross was a stumbling block to those not open to God’s plan of salvation 2000 years ago. This is why your visit to Him today is so important. You console Him for those who turn away from His Eucharistic love. In our consecration to Mary, she takes all our thoughts, words, and actions and makes them pleasing to Jesus BY PURIFYING THEM IN HER LOVE, clothing them in her merits, presenting them to His Eucharistic Heart that He may see and love in us what He sees and loves in His Mother. This is the joy of consecration! Blessed Sacrament Prayer : Jesus take our wretched hearts, and give us a ‘new heart’ by giving us Your very own. During this mystery, we renew OUR TOTAL CONSECRATION to the Immaculate heart of Mary, through Mary, we offer to Your Eucharistic Heart all that we have and all that we are, “totally Yours, totus tuus”.